India's tour of Australia between December 2018 and January 2019 was a highlight for two very different reasons. The first was related to the sensational performance by the Men in Blue, which saw them complete a first-ever Test-ODI double over the Aussies. And the second, well, was in complete contrast! The babysitting banter, which took place during the Test series, was, on a lighter note, something to remember. It took place between Australian skipper Tim Paine and India's Rishabh Pant, and the funny incident escalated with Paine's wife, a few other Indian players, fans and even Amul getting involved. And now, ahead of Australia's tour of India later this month and in March, former Indian opener Virender Sehwag, in a hilarious TV advertisement, has brought back the whole saga. In the Star Sports' advertisement for the upcoming series, Sehwag could be seen having a bit of fun with babies wearing Australian jerseys. "Aley aley aley, dekho kaun aaya hai idhar? Australia ki paltan aa gayi hai. Aley aley aley.....Jab ham Australia gaye the toh unhone pucha tha babysitting karoge? Humne kaha, sab ke sab aajao, zaroor karenge," Sehwag said before adding, "Bas vo hamare iraadon pe paani na pher dein." During the Day Three of the third Test between the two sides, Paine, while standing behind the stumps, had a go at Pant who was at the crease. The Aussie skipper had a go at the young Indian batsman by asking him if he'd like to babysit his kids. But Pant did not let the banter die, and gave the Aussie skipper a taste of his own medicine during Australia's innings. When Paine came out to bat, the young Indian wicketkeeper-batsman went a step further and roasted his opposite number with his remarks. "We've got a special guest today, come on boys. Special appearance today boy, come on. No responsibility there from captain. Running away, always running away. Too difficult, too difficult," he said before adding, "Have you heard of the word, a 'temporary captain', ever? I am seeing it. You don't need anything to get him out. He loves to talk, that's the only thing he can do. Only talking, talking." 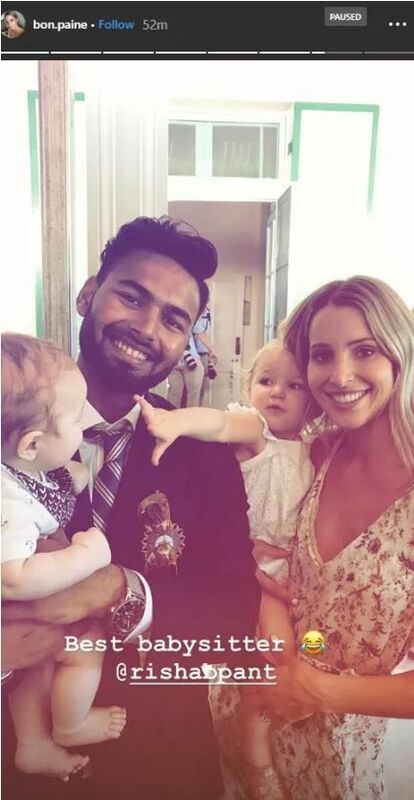 The whole saga took an even funnier turn when Pant took Paine's challenge seriously, and ended up babysitting his kids when the Indian team went to meet Australian PM. Bonnie Paine, Tim Paine's wife, shared a photo on Instagram related to this.